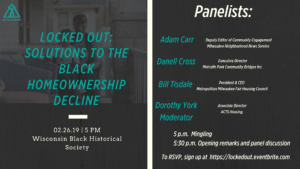 Historically African-Americans have been ‘locked out’ of homeownership due to redlining, discrimination in lending and disparities in homebuyer education. This panel seeks to find solutions by engaging thought leaders on the issue. Danell Cross Executive Director, Metcalfe Park Community Bridges, Inc.